1. 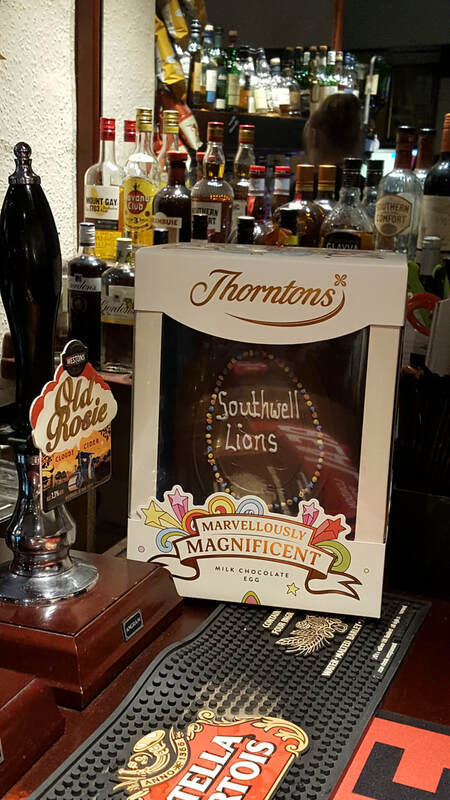 Giant Thornton Easter Eggs will be raffled in approx 12 local pubs from mid March. To take part you pay £1 to select a number from 1 to 100 from the pre-printed Grid Sheet and put your name & telephone number in the box on the sheet. Each pub will open the envelope giving the winning number when the sheet is full or at the latest on Easter Monday when the (nearest) winning number is revealed to win the Egg. In addition there are eggs at Southwell Rugby Club and the Racecourse Golf Club. Roger & the 2 Graham's doing their best to keep smiling on a damp Easter Saturday morning! ​2. We will also have a stall on the Market Square in Southwell on Easter Saturday morning 31st March. There will be eggs of various sizes to win in the tombola including a Thorntons Giant egg. The tickets are 25p each and drawn by participants from a Tombola drum for instant wins.